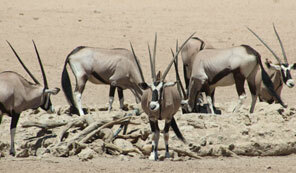 Experience the rugged beauty of Namibia's South. Highlights include the Kalahari Desert and hike with the San, Fish River Canyon, Lüderitz, Kolmanskop, Sossusvlei and Swakopmund. We depart early from Windhoek, travelling south towards the Kalahari Desert. This beautiful semi-desert area of red sand and rolling dunes is also home to a wide variety of plants and animals. Dunes are dotted with patches of yellow grass, while shepherd trees and thorny acacias add shades of green. The Kalahari supports herds of oryx, springbok and ostrich, as well as cheetah, zebra, jackal, porcupine, badger, mongoose and many more. We arrive at our campsite and have lunch before setting out on a special hike with the San (Bushmen). The Kalahari is regarded as the traditional homeland of the San. Although their traditional way of life is fast disappearing, there are still places where their ancient culture survives. Learn their stories, knowledge and skills on this unforgettable journey. We return for a barbeque dinner at the campsite under a vivid slarlit sky of the unspoiled African bush. We have breakfast while watching a beautiful sunrise behind the red, Kalahari dunes, and then depart towards Keetmanshoop and then west to the Fish River Canyon. We continue towards Ai Ais, where the canyon ends and where sulphurous hot springs form natural pools in the area. We will set up camp here, near to the Fish River. Today we continue south, visiting one of the largest raisin cultivators along the way at Ausenkher. 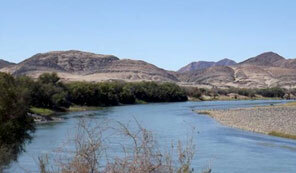 We continue on our panoramic journey along the Orange River, passing by Rosh Pinah, a small mineral town. We stop over and take photographs at the point the Fish River meets the mighty Orange. We arrive at our campsite in Aus where we will enjoy dinner and spend the night. 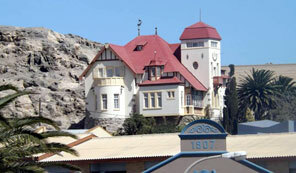 Lüderitz is a quaint, harbour town, known for its German colonial architecture. We will visit Diaz Point, just a few kilometres from the town, where the renowned Portuguese explorer, Bartolomeu Dias, erected a stone cross. The rocky coastline and crashing waves of the mightly Atlantic make for a spectacular backdrop and you may spot some seals and penguins. We also visit Kolmanskop, the famous ghost town which lies abandoned in the sands of the Namib. It grew out of a diamond rush in early 1900s, but was later abandoned when the diamond-field was exhausted. We have lunch en route and stop over at Garub to see the wild horses, before returning to our campsite at Klein Aus. After breakfast at the campsite, we depart in the direction of Sesriem. This is another panoramic journey, with rolling dunes along the west side of the road. We will enjoy lunch en route, prepared by the team. We settle in and have dinner and overnight at our campsite. We then set off on our journey to Sossusvlei, stopping to have breakfast in the dunes. We will visit the much photographed Dune 45, a stunning star dune which stands over 170 metres. Sossusvlei itself is a large, white, salt and clay pan located in the midst of this ancient, red wilderness and provides wonderful photographic opportunities. Occasionally the pan fills up with water offering a fantastic spectacle as the glassy lake reflects the surrounding dunes. Nearby is Deadvlei, another dry pan which is characterised by the ghostly skeletons of scorched dead trees, some as old as 1000 years, standing scattered across the white expanse. This eerie scene of stark contrasts, makes for stunning photographs. Lunch will be had back at the campsite before visiting Sesriem canyon in the afternoon. The canyon has been shaped over millions of years by the Tsauchab river and is one of the few places in the area that holds water all year round. It is up to 30 metres deep at points and about 1km long with a width of between 1 and 3 metres. The canyon is a fun and interesting place to visit and walk through it narrow passageway viewing the different rock formations and exposed layers along the way. We watch the sunset at Elim Dune before returning to the campsite. Today we depart for Swakopmund, one of Namibia's charismatic coastal towns. We stop over at Solitaire, famous for its German cake apple tart. We continue our journey, passing by the Gaub pass and Kuiseb river, where two Germans once hid, trying to escape the South Africans. We arrive in Swakopmund and settle into our accommodation. Dinner tonight is on your own account. We have breakfast at the hotel, before departing back to Windhoek. Check in at your hotel/guesthouse, depending on your flight. We wish you a safe return back home and we strongly believe that you enjoyed your time with Omuhimba safaris!